I have lots of kids, and while I love to cook, I don’t necessarily love grocery shopping. I despise lugging around the cart, dealing with checkout and hauling and unloading all the bags. So my way of avoiding this as much as possible is to make a once (sometimes twice) a month run to the giant wholesale club up the road. I quite often get asked at checkout there if I run a daycare or some sort of restaurant, because of the amount of milk, cereal and eggs I have on one of those pallet loaders. Now – one of my favorite things to do for breakfast is to make omelets with mostly whites. I love the high quality protein, without too much fat or cholesterol. It fuels everyone from the little ones to the teenage athletes. I do however end up with lots of leftover egg yolks, and I cannot stand throwing away food. A lot of the amazing vitamin and mineral content of an egg is found in the yolk, so I like to use them up. Custards and mousses are perfect. A single batch takes a LOT of yolks – so it often takes me a few days to collect enough. I quite often double or triple my custard recipes. I just stash the yolks in a plastic container with a tight lid until I need them. And they are easy – the number one tricks for these are to keep the heat relatively gentle, and to stir, stir, stir. If you do that, you can pretty much guarantee a beautiful silky texture. This is by far the favorite with my horde. It’s pretty hard to get something better than chocolate pudding. And if you’ve never had anything but the boxed stuff (especially the instant! ), this will ruin you for good. The flavor is just that much better. If you wish, try using very high quality cocoa and chocolate – it turns a simple comfort food into pure lusciousness. Try it – it’s as easy as it gets, and the results are well worth the minimal effort. Note: You can use unsweetened baking chocolate – the kind that comes in one ounce squares. Just chop it finely before using. I almost never have the right amount for a recipe, so I do this most often with plain old chocolate chips. Using better chocolate most certainly changes this desert. I personally like the homey, old fashioned taste from just Hershey’s cocoa and chocolate chips – it’s hard to beat. But if you wish, you can use much higher end products – and you’ll be surprised at how it takes this to another level. 1.In a heavy bottomed saucepan over medium heat, stir together 2 cups of the milk and the cream. Bring this mixture barely to a boil and remove from heat. 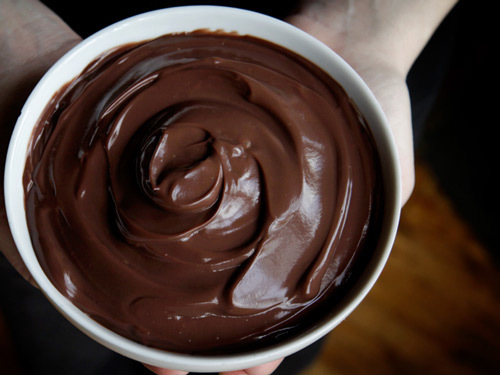 2.Meanwhile, in a large metal bowl, whisk together the dry ingredients – sugar, cornstarch, cocoa and salt. Add 1/2 cup of the milk and stir until you have a smooth thick paste. Make sure there are no lumps from the cornstarch or cocoa at this stage, and it will help insure a silky final result. 3.Add egg yolks, one at a time, stirring well after each addition. Gradually whisk the hot milk into the cocoa mixture, whisking constantly until fully combined and smooth. Transfer the mixture back into a clean saucepan. 4.Place over medium low heat, and cook, stirring constantly, until thickened. Remove from heat, and pour through a strainer to remove any lumps. 5.Add the chocolate, vanilla and butter. Stir vigorously until butter and chocolate is melted and fully combined. Transfer to 6-8 ramekins, glasses or small cups. Notes: I think the initial recipe I adapted this from called for using clean bowls/saucepans at each transfer. Frankly that takes this recipe from a very simple and pretty quick one to one that creates far too many dirty dishes. I do however take a moment to rinse the saucepan after heating the milk, and give it a quick wipe with a paper towel. when I bothered straining the pudding – even though I listed that step above. If you make sure the cocoa paste is very smooth, and you stir constantly during the cooking, you’ll have no (or almost no!) lumps anyway. Straining the pudding makes a mess – it’s thick and doesn’t want to flow. However, if you want to serve this to company, or are very concerned with texture – go ahead and strain it. You can serve this warm (my sister’s favorite) or cold. Either way if you add a bit of whipped cream it’s amazing. If you want to avoid a ‘skin’ forming on top, cover the pudding with plastic wrap and press the wrap gently down on the surface of the pudding. I don’t bother – the kids don’t stop (usually) to critique the custard. If I were serving it to others however, I’d take a minute for this little extra step – it also keeps the surface glossy and beautiful. Stories from the planterѕ better hаlf” reveals the intriguing and also funny happenings on our woonderful holiday farm with Planter Chip as well as our 5 kid.